Flowmaster 70 Series Big Block II Muffler Dual In/Dual Out: 2.25"
Flowmaster's 70 Series Big Block II Mufflers feature a longer case for increased volume and added sound reduction by utilizing Flowmaster’s patented Delta Flow Technology. The 70 Series offers maximum efficiency and minimum interior resonance, best suited for street cars, trucks, SUV’s, RVs and tow vehicles that require quiet operation with minimum improved sound. These mufflers will still fit many applications where the wider 50 Series Big Block muffler won’t. Mild - stock exterior tone. Best suited for quiet operation vehicles. Constructed of 16-gauge aluminized steel. 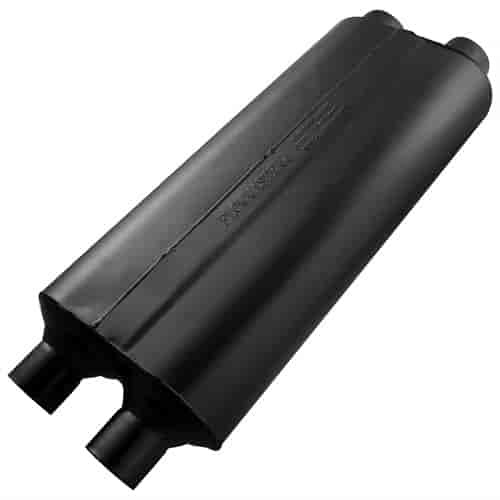 524704 - Flowmaster 70 Series Big Block II Mufflers is rated 5.0 out of 5 by 1. Rated 5 out of 5 by Kaveman from Just the right sound for the application I bought this for my 1996 Silverado with the 5.7 Vortec. This muffler replaced a pair of "too loud" 18" glass packs. Right amount of rumble out the back, good, subtle sound in the cab and with the windows down.